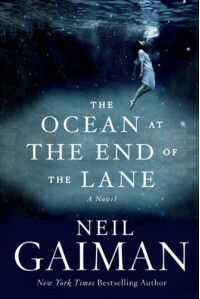 It's a Neil Gaiman book that has to do with mythology, which should mean that it's perfect for me... Only this one suffered from the same problem that American Gods did: it was trying far too hard to be dark and "realistic". I definitely found myself enjoying this one far more than the other one, but found it getting more and more stale and forced the closer to the end it got. The beginning made me feel giggly and excited to know what will happen, while the second half mostly had me thinking that I'd really like to finish the book today and should therefore continue reading. I also got a bad vibe from the way children were seen in the book - it is a sentiment that I see fairly often, that children have a magical way of seeing the world, that adults lose it and so on, and I honestly don't think it has to be the case. I have known many imaginative adults, who create weird worlds in their head as they're talking to you and there would likely be way more if we would just stop thinking of imagination as a "kid thing". Still, overall an enjoyable read with its own mysticism and mythology and one that made me think.